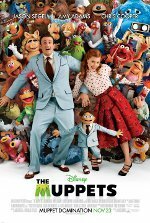 Muppets are Back on the Big Screen! You might have seen TV’s “The Muppet Show” in re-runs or on video tape or you might have one of their fun movies in your DVD collection. Either way, since their last movie 12 years ago, these zany, clever felt characters have been doing commercials and public service announcements and have never really disappeared from our lives. 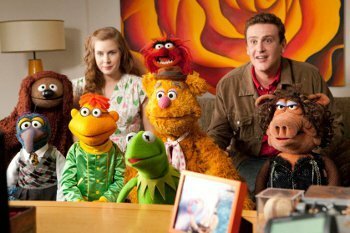 Now, the Muppets are back on the big screen in a fun new adventure starring Jason Segel (TV’s “How I Met Your Mother” and movies like Forgetting Sarah Marshall) who also wrote the script. Jason was a huge Muppets fan as a kid and wants modern kids to have as much fun as he did with diva Miss Piggy, her love Kermit the Frog and a new Muppet named Walter who plays his brother in the film (yeah, a felt brother.. don’t ask. It works). We are near Rodeo Drive asking Jason, his love-interest co-star Amy Adams (Enchanted) and Muppets Miss Piggy, Kermit and Walter all about singing, dancing and bringing The Muppets back! Kidzworld: For Jason and Miss Piggy. As a writer, how did you conceptualize the story line or what was your inspiration? And when you got to Miss Piggy’s part, how difficult was it to carry through or was she the editor of her part and how often did you have to send rewrites to her? Jason: Well, I’ll start at the first part of the question, because the second part is very delicate, frankly. And we tend to get into trouble when I answer this question. Miss Piggy: [looking suspicious] Uh-huh. Jason: Well, coming up with the idea of the movie was actually fairly simple. What do the Muppets do best? They put on a show. So I knew ultimately the movie was going to be about putting on a show. That’s the real spirit of the Muppets. Also, they always had a great villain. So we thought of Tex Richmond, the evil oil baron. And then, what occurred to me was that it’s been 12 years since the Muppets were last on the big screen. And I wanted to acknowledge that this movie was bringing them back to the forefront of comedy where they belong. Because they should have been making movies this whole time, grand, big dance movies, song and dance numbers like the old MGM style of musicals. So it was about getting the Muppets back together sort of as a metaphor of getting back onto the big screen where they belong. As for Piggy’s part, she wanted it bigger. I’m not going to lie to you. And she wanted a very strange credit sequence where we would all be introduced, and then it would say “And Miss Piggy” but then that would just stay on throughout the entire movie. Miss Piggy: I see nothing wrong with that. But, yes. Well, you know what, I did not demand any rewrites. I want to go on the record for that, but that’s probably just because I didn’t really read the script. I would just show up on the set and you know people say their lines, and then I say whatever comes into my head. Kermit: And the rewrites were basically around Piggy’s improvisations. Miss Piggy: I thought it turned out good, though. Yeah. Kidzworld: Miss Piggy, I very much enjoyed your photo spread in In Style Magazine, and I wonder if you’re going to do more of that. And how did you enjoy your couture wardrobe in this film? Miss Piggy: Well, I just want to say I am sorry about that spread in In Style. I am sorry to all the ladies who have lost their beaus, their husbands to moi. Because people just instantly fall in love with moi when they see me in that spread. And I just want to apologize. But the couture that I wore in the movie I loved it all. You know, I had a wonderful Zac Posen dress that I wore at the end. No, I’m not kidding. I’m not kidding. I had just a wonderful wardrobe. Kidzworld: Amy, is this a return since Enchanted to Disney singing and dancing and music? And if so, how did this come about? Amy: It is a return to singing and dancing. It was a lot of fun and I got involved because Jason and Kermit sent me a DVD singing to me and asking me to be in the film, and I started crying and I think I knew I’d blown the deal. Like I was definitely doing the movie. Kermit: Of course the tears were different by the end of the film for a different reason. Kidzworld: Miss Piggy, how does it feel to be back together with Kermie? I mean, what is your relationship status? I think all of our visitors would really like to know that. Kermit: I was wondering if I could have a rebuttal after she’s done. Miss Piggy: [to Kermit] Well, you don’t know what I’m going to say. I was going to say how happy I am to be here seeing Kermie today because I haven’t seen him in such a long time. We’ve been so busy on the road promoting this movie. Miss Piggy: And I was just going to say how much I love him. Miss Piggy: [angry] You want to rebut that? Kermit: No! I just want to add my own little comments, and I just want to say that I’m thrilled always to perform with Miss Piggy. I think we make a great duo and it’s wonderful to be together here today, and pretty much any time we’re together and that’s all I’m going to say. Kidzworld: Kermit, I know you were a former newsman yourself and reporter for Sesame Street News. I was curious on your feelings about the press tour that you’re on right now and the proceedings today. How does it feel to be on the other side? Kermit: Well, that’s unusual but it’s fun, right? We’ve got this great rock star room upstairs, you know, with a view and lots of cookies. Walter: Yeah, I can’t wait until after the press conference so we can trash it. Kermit: Yeah, that’s going to be great. 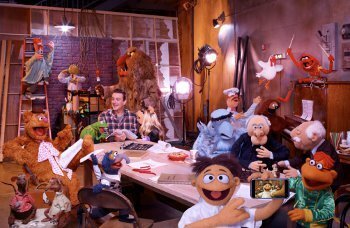 Kidzworld: Jason, can you talk about growing up with the Muppets? Jason: I did grow up with the Muppets. Like when you’re a kid, Muppets are sort of the entryway into comedy. They lead into harder comedy, “Monty Python” and “Saturday Night Live”. Yeah, the Muppets sort of defined who I wanted to be as a comedian when I was a kid. I’ve told Kermit. He really was my idol. So I sort of modeled my career after Kermit and the rest of the Muppets. Kidzworld: I wanted to ask Jason and Amy about doing the big singing/dancing finale on Hollywood Boulevard. What was that like for you? Jason: Ah, well, the dance number came very naturally. You can see by my body I’m not made for dancing. Yeah, I’m very lithe and agile, and I was happy to be able to help Amy to sort of get her footing. [he’s kidding]. Amy: I really needed Jason because we actually learned that dance in about an hour on the same day we shot it. So I’m telling you Jason is actually much more talented than he gives himself credit for. He’s actually a very, very good dancer, and to partner I mean he was quite a natural I have to say. Jason: [Puzzled] You were afraid I was going to drop you. Amy: He only broke a couple ribs, and he didn’t drop me but he did lift my skirt up by accident once. That was embarrassing but it was a lot of fun. Jason: Yeah, that was actually a special night for me, too. We filmed that the night of my birthday and Hollywood Boulevard was filled with thousands of extras, and I walked out and all of the Muppets sang me happy birthday which was like the greatest moment of my life. It was fantastic. Kidzworld: Cool! Walter, I wanted to ask you how did you discover your talent for whistling? Walter: In addition to the Muppets, I loved the old “Andy Griffith Show”, and it was always a childhood goal to try to whistle that catchy theme. And a lot of times I get mistaken for a tea kettle when I was first learning. Kidzworld: Walter, you’re the new guy. How does it feel to be so embraced and welcomed by the Muppets? Walter: Well, how else could it feel? It’s unbelievable. You know, I keep pinching myself. I have bruises to prove it. This sort of thing doesn’t happen every day and certainly not to me. It’s just been overwhelming and a real dream come true. We’re a pretty easy bunch to come into, you know. We’re pretty accepting. Kidzworld: Walter, what was it like being on the stage, in “The Muppet Show” in the movie. Also, might “The Muppet Show” go back on TV? Walter: Yeah. Oh, my gosh. What an experience that was. You know, they recreated the whole Muppet Theater and it was kind of mind blowing really. You know, it brought tears to my eyes in the first day seeing the set. It was just remarkable. Jason: And I believe that that Muppet Show theme song was the first time it had been recorded in 30 years or something like that so it was really kind of inspiring for all of us. I think everyone got choked up. Walter: Yeah, some because of the quality of that set. We had a wonderful time and well, we should probably put the question to everyone if you think it’s a reasonable time for something like “The Muppet Show” to come back. That would be fun after all these years, you know. But I hope if it happens. Kidzworld: Miss Piggy I was wondering after the long days on set what do you do to maintain your flawless appearance and what sort of beauty tips could you share? And then for Kermit after all this time has it gotten any easier being green? Miss Piggy: I’ve never really had a problem with aging. You know, Pigs don’t really get wrinkles. The truth is you know that stuff they inject into your face, into your lips? Restylane. That stuff comes from my people. They get that from pigs, you know. Kermit: You know when I first sung that song about being green years ago it was about being comfortable in your own skin. And I think it might have helped a little bit, and I think we all are more comfortable there. That was sort of the battle cry of the Environmental Movement, which is fine because I’m quite low on the food chain and very close to the environment we’re trying to take care of. So that is getting a little easier, too, being green. Walter: You were green before it was hip. Kidzworld: It has been 12 years since we’ve seen you in a movie and the years have been kind. I look at you and I don’t want to imply that you’ve had some work done. So perhaps you can quash any rumors that you have. Miss Piggy: I think with Kermit you see he doesn’t have any hair, as you know and it can’t really turn gray. Kermit: If I turn gray all over that’s a whole different story. Miss Piggy: It wouldn’t be good. You’d probably be in some classroom somewhere. Kermit: [to Piggy] You know, I think you have to come clean. I think you’ve been put on the spot. You could avoid the question, but I think you should answer the question about whether or not you had any so-called work done. Miss Piggy: Well, Moi is perfect, perfect in every way. Oh, we’ll just say I’ve gotten a little more perfect over the years. Kidzworld: Jason, of the older Muppet films, do you have a particular favorite or one that maybe inspired you more than others? Jason: Well, the first three are the ones that I grew up on, and I think there is something about them that’s lodged in my brain and sense of humor somewhere. The Muppet Movie, The Great Muppet Caper, and The Muppets Take Manhattan each influenced it a little bit. I kind of borrowed one of my favorite jokes from the The Great Muppet Caper. Walter and I are brothers, and we don’t really feel the need to explain it. Just like in that movie they never explained that Kermit and Fozzie Bear were identical twins. Growing up, I thought that was one of the funniest jokes I’d ever heard. And then yeah the idea in Manhattan nowadays you know that they’re putting on a show in The Muppets Take Manhattan. That was part of the putting on a show element. Then the meeting the gang along the way came very much from the original Muppet Movie. So it really is sort of a mix in paying homage to those three films. Kidzworld: This comes out at Thanksgiving time. Do you all have Thanksgiving plans? Walter: Well, I’m going to go out to the movie theater and watch The Muppets. Jason: That’s right. And one of the good things about Thanksgiving releases it’s a great place to go with your entire family where you don’t have to speak to each other. That’s what I love most about the Thanksgiving release. Miss Piggy: Well, who is it that they fill with helium and send down the avenue in New York in the parade every Thanksgiving? Kermit: Well, that’s the bigger rubber version of me. Amy, what are you doing this holiday season? You have a beautiful child. Amy: I do. I’m going to be spending it at home with her. Yeah, you guys are welcome to come over. I’m sure she’d love to see you again. I’m going to cook. Miss Piggy: I have to keep promoting this thing. Yeah, I’m going to be on a plane eating plane food. 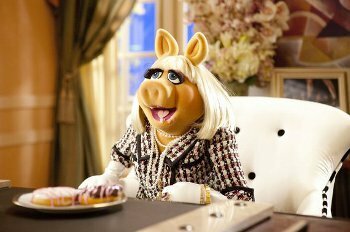 Kidzworld: Miss Piggy, in the film, we learn that you have been a Vogue plus-sized fashion editor in Paris. Do you feel living in Paris has refined you any? Miss Piggy: I would have loved to have lived in Paris for a while, while shooting this movie. But unfortunately we shot everything on a Hollywood back lot except for the car shots. I think they actually took a car to Paris but they did not take moi. Jason: That was one of my tricks like when I wrote Sarah Marshall I made it take place in Hawaii, and when I wrote the Paris scenes I’m like, “Yeah, a free trip to Paris.” And they’re like, “No, we have Paris right here. We have it on the back lot. We’re good.” So it was a bummer but yeah. Kidzworld: Jason, you have a lot riding on this film. Are you nervous about it? Jason: I’m not so nervous about the movie coming out because everyone who has seen it seems to love it. I think what I’m more excited about is this thing that’s born in your brain, you know, five years ago. And it stays in your brain for a while and then is slowly moves to an editing room, and you’re stuck there with five or six people watching it. And finally, it’s going to get to sort of be born, and everyone is going to get to see it and enjoy it. I’m just so proud of it. It’s the thing I’ve done in my career that I’m most proud of without a doubt. Kidzworld: Can you talk about getting a chance to revisit some of those great old songs like “Rainbow Connection” and “Mahna Mahna?” What was that like? Kermit: That was wonderful. I mean I never stopped singing that song in the last 12 years since we did our last movie. It’s wonderful to have the chance to sort of I don’t know, reintroduce that particular song to our new younger audience. I think it’s still quite relevant. Do you guys think that? Walter: Oh, absolutely. I think “Mahna Mahna” is as relevant today as it was back then. I mean talk about inspirational lyrics. Jason: One of the important things about the movie and like the witch’s brew that we had to try to balance was we wanted a fair amount of nostalgia for our generation who grew up with the Muppets. But we also had to acknowledge that there is a generation of kids who are just being introduced to the Muppets. And so, if it had just been a nostalgia fest it really wouldn’t have meant anything to kids who didn’t experience it the first go around. 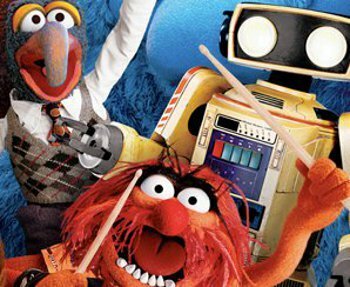 So we have a really healthy mix of old songs, and then new songs written by Bret McKenzie that are in my opinion just right in the spirit of the Muppets. In my opinion [Bret’s work on] Flight of the Concords is very Muppety on its own. It’s about two kind of wide eyed innocents making their way through tough New York who are never mean to anyone. And it’s very much how I feel about the Muppets. So it was a really good union of styles. 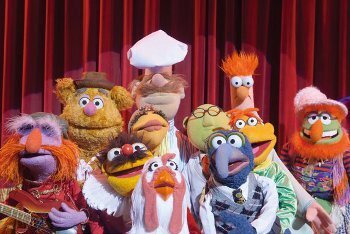 Kidzworld: Were there any of the supporting character Muppets that were trying to take the spotlight away from the stars while shooting? Kermit: Always. We encourage that. Ever since the Muppet Show it’s always been about us trying to upstage each other. So we encourage that, yeah. 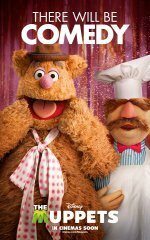 Jason: One of the fun things about the Muppets I find just as a fan is that it feels like this controlled chaos that could bubble over at any minute. And that’s the fun part that Crazy Harry is blowing things up all the time. Kidzworld: I’ve got one for Piggy. You and Kermie have been together for a while now. What advice do you have for finding and keeping a good guy? Miss Piggy: Well, implanting one of those GPS chips on him. That’s a really good way of keeping track of him. Kermit: In a place that the guy can’t find or reach. I’ll stop there. 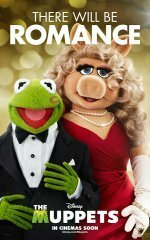 Kidzworld: Hi, for Kermit and Miss Piggy, I was wondering how was working on this film different than working in the past on television shows and other movies? And for Walter, Jason and Amy, what did you take away from this experience that was different from other movies that you’ve worked on? Kermit: How is different? Well, it’s a new year. There was new food. It was wonderful. You know, one of the great things about the work we’ve done over the years is that we get to work with wonderful celebrities and this time it was Jason and Amy and other stars. I always cherish those experiences. That’s what moves us forward. That’s the stuff we look back on as we move forward, and Walter is with us now. And I hope our fans like what we have out there. Walter: Yeah, for me it was actually my first experience. I’m hoping the first of many more, and I was just really amazed by the professionalism and just how incredibly crafted this whole film was. I mean, just speaking of the film as a piece of art, it’s just so deliberate and crafted and gone over with a fine toothed comb. And I think that speaks to the professionalism of everybody that worked on it and Jason and Amy. Amy: For me, I think it was my first family film that I did after having a daughter, and it was really, really cool to work with the Muppets. They were a big part of my childhood. So every day was sort of me reliving my childhood while I had a child, and that was really, really cool and really special. It’s just going to be fun to introduce her to these guys and to know that I have a relationship with them. And I’m just excited. I’m excited that she has a film that she can watch as well. Jason: There are a lot of reasons to choose what movie you’re going to do next, and nothing can ever beat doing something that you love. That was the lesson I took away from it. I was working with my childhood idols and with I think the best actress of our generation. [He’s referring to Amy].